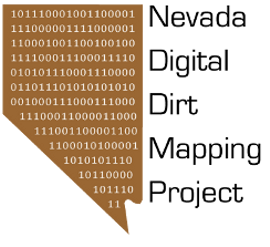 Welcome to the blog of the Nevada Digital Dirt Mapping Project (Phase 1). The Nevada Digital Dirt Mapping Project (ND2MP) is an initiative to collaboratively compile a surficial geologic and geomorphic map of Nevada at approximately 1:100k. Phase one of this project spans the entirety of Clark County, Nevada, and began in November 2008. It is to be complete by May 2010. Actual field and office work will commence in January 2008. We hope to ultimately extend the mapping and the related conceptual framework to the entire state of Nevada. The project's focus on surficial geology and geomorphology reflects interest of currently available sources of funds. It will also be easier to deal with than the bedrock. If fully realized, the map data set will be an essential resource for geoscientists and possibly a model for similar projects in adjacent states or regions. As it progresses, the mapping will be made available online. It will be accompanied by sets of geotagged photos, high-precision GPS data points, and a GIS database of published geochronological data, among other things. The goal of this blog is to chronicle the development of the data set and, more importantly, to actively engage the relevant members of the geological community in discussing, critiquing, and reviewing the development of the map. Our goal with Phase 1 of ND2MP is to develop a fully digital surficial geologic map of Clark County by compiling all existing digital geologic data sets that adequately portray surficial deposits and generate new mapping in areas where the surficial geologic detail is lacking. We will develop a geologic nomenclature that is commensurate with existing, well established frameworks established in the most detailed published maps. Any changes the we propose will be offered to the relevant members of the geologic community for comment during (not after) initial compilation of the map. The final point above is key. This project is being initiated as an experiment in online scientific collaboration. We are keenly aware that many geologists have published maps and have carried out detailed research projects in Nevada, particularly Clark County. Our goal is to maintain an open and collaborative mapping effort that transcends simple compilation of existing mapping. In other words, we are completely open to direct input from all interested and qualified scientists who have mapped in the area. This may include, for example, guidance in modifying or generalizing published mapping for the compilation, inclusion of relevant, unpublished data, revision of published mapping, etc. There are many possible examples.